The man who was to become the founder of aikido was born in the seaport town of Tanabe, in present-day Wakayama Prefecture, on December 14, 1883. His father, Yoroku, was a of considerable means who served many years on the local town council. Anecdotal evidence of Yoroku's great physical strength survives and some have speculated that Morihei's father was a skilled martial artist in his own right. Yoroku was overjoyed at the birth of Morihei, his only son, after first having three daughters. Morihei was sickly as a child, and his father went to great lengths to improve his son's health and encouraged him to build up his frail body. Morihei's education continued only up through the first year of middle school. At age seventeen, he left home to become a merchant in Tokyo with the assistance of wealthy relatives and worked in a stationery business. It was during his brief stay in Tokyo that he had his first formal martial arts training at a Tenjin Shinyo-ryu jujutsu school where he practiced in the evenings. Morihei was forced to leave Tokyo after less than a year when he fell ill with beriberi. He returned to his native Tanabe where in time he recovered fully. Ueshiba joined the army in 1903. Morihei's affinity for martial arts became clear particularly during bayonet training where he proved to be one of the most adept of the soldiers. During his military service Morihei also had an opportunity to train in a branch of the Yagyu school, possibly the Yagyu Shingan-ryu, near Osaka where he was stationed. He was discharged from the army in 1906. The next several years in Morihei's life back in Tanabe were restless ones as he sought a new direction in life. For a short time he dabbled with judo, when his father brought in a young instructor from the Kodokan Judo Headquarters to teach the local youth. Morihei organised and led a party of fifty-four families to Hokkaido in 1912. The group eventually settled in the remote area of the northern part of the island that was to become the village of Shirataki. The most significant event during these years, at least in terms of the development of aikido, was Morihei's meeting with an eccentric, but highly skilled jujutsu teacher, named Sokaku Takeda. Takeda had some years earlier taken up residence in Hokkaido, where he frequently traveled about conducting jujutsu seminars. Morihei first met Sokaku in february 1915 in the town of Engaru. Although the thirty-two-year-old Ueshiba was already quite skilled as a martial artist, he was no match for Takeda, who was then in his prime. The future founder of aikido was fascinated by the powerful and intricate techniques of Sokaku's art, known as Daito-ryu jujutsu. Morihei devoted a great deal of time and resources to learning Daito-ryu and even invited Sokaku to live with him so he could receieve personal instruction. Ueshiba spent a large amount of money to study under Takeda and was assisted by his father who sent funds from Tanabe to allow Morihei to meet expenses. Morihei became one of Sokaku's top students and sometimes accompanied him on teaching tours around the island. During his stay in Hokkaido, Ueshiba received a first-level transmission scroll from Takeda and gained considerable skill in the art. The Daito-ryu curriculum he studied consisted of several hundred jujutsu techniques with complex maneuvers, joint-locks, and pins. Takeda also demonstrated an ability called "aiki" in which he controlled the mind of the attacker, thus neutralizing his aggression. He was also an expert in the use of the sword, shuriken, and iron-fan, among other weapons. The techniques of Takeda's jujutsu would later form the basis for virtually all aikido movements and its contribution to Morihei's art cannot be overstated. Morihei left Hokkaido in December 1919 and went to Tanabe due to his father's illness. During his return to Tanabe he met Onisaburo Deguchi, the leader of Omoto religion. Onisaburo Deguchi was impressed with Morihei's martial arts skills and encouraged him to instruct interested Omoto believers. This led to the opening of the "Ueshiba Private School" in his home, where Morihei taught Daito-ryu jujutsu. 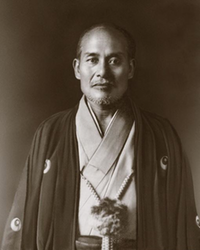 In 1924, Ueshiba made a trip to Mongolia with Onisaburo Deguchi to expand the influence of Omoto religion. After his return to Japan, Morihei settled back into life in Ayabe. His Daito-ryu students included a number of naval officers, the most prominent of whom was Admiral Seikyo Asano, also a devout Omoto believer, and gradually word of his martial arts prowess began to spread. 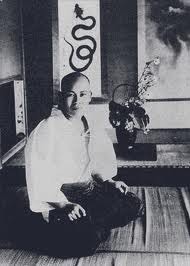 Asano spoke highly of Ueshiba to his navy colleagues and encouraged another Admiral, Isamu Takeshita, to make a special trip to Ayabe to observe Morihei's art. Takeshita was extremely impressed and soon arrangements were made for Morihei to conduct demonstrations and seminars in Tokyo. Ueshiba's patrons also included retired admiral and two-time prime minister Gombei Yamamoto. His exceptional jujutsu skills and charisma made him a popular instructor among the Tokyo military and political elite and he made several trips to the capital between 1925 and 1927. Finally, Ueshiba decided to move his family to Tokyo to pursue teaching full time. Ueshiba's art, which went under several different names during the early Tokyo years, gradually grew in popularity. Finally, in 1931 Morihei opened the Kobukan Dojo. Among Ueshiba's live-in disciples and students during the Kobukan Dojo period were such well-known practitioners as Yoichiro Inoue, Kenji Tomiki, Minoru Mochizuki, Tsutomu Yukawa, Shigemi Yonekawa, Rinjiro Shirata, and Gozo Shioda. As a result of his many contacts with naval and military officers, Ueshiba was engaged to provide martial arts instruction at various military institutes such as the Toyama school for army officers, the so-called "Nakano Spy School", the Naval Academy, as well as other locations. Actual instruction was often delegated to senior students from the Kobukan as the demands on Ueshiba's schedule increased. 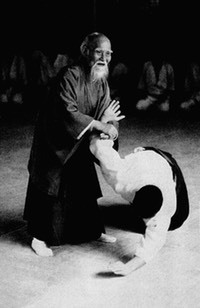 For a part of this period Ueshiba actively taught the techniques of Daito-ryu aikijujutsu, as Takeda's art was sometimes referred to, and he awarded transmission scrolls bearing the name of this school. 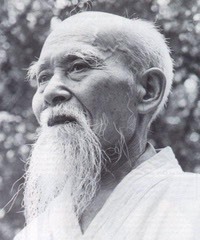 He seems to have had no further direct contact with Takeda after about 1935, although the techniques of Daito-ryu in modified form still constituted the majority of Ueshiba's technical repertoire. The name most frequently used to refer to his art during the prewar years was "aiki budo". After spending several years in seclusion at Iwama, the founder began a serious study of the sword and staff-known in aikido as aiki ken and aiki jo. He regarded an understanding of the use of these weapons as fundamental to the proper execution of open-handed techniques. In fact, Ueshiba's conception of the aikido curriculum was that of a comprehensive system that included training both with and without weapons. 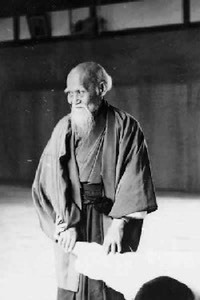 For most of this period, young Saito was Ueshiba's training partner, and he was exposed to many techniques and insights which the founder did not generally teach. During this phase of his life in Iwama, the founder also formulated the concept of takemusu aiki, that is, the spontaneous execution of infinite techniques in a manner completely appropriate to the specific circumstance. It was finally Morihei's Aikido, Iwama ryu Takemusu aikido. 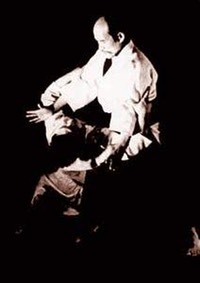 Many students who began training after the war and who actually had an opportunity to see the founder teach and demonstrate were inspired by his energetic yet graceful movements, as well as by his ethical views on martial arts. In his later years, as Morihei's health began to gradually decline. Many of his techniques became abbreviated and he would throw his young and powerful students with a rapid gesture, or the flick of a hand, sometimes without even touching his partner. 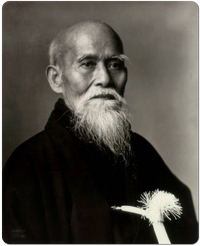 The founder's aikido in the last years of his life can be understood as a natural development of his previous experience, but as Ueshiba himself was fond of pointing out, his abilities at this stage were the product of more than sixty years of training. The wide exposure he received through his public demonstrations and the later availability of films has spawned many imitators.